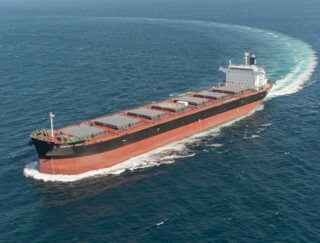 Archer Daniels Midland Company (ADM), a US-based specialist in grain processing, has taken delivery of the first new bulk carrier developed by Mitsubishi Heavy Industries, Ltd. (MHI) that uses air bubble lubrication system. MHI’s proprietary Mitsubishi Air Lubrication System (MALS) reduces frictional resistance between the vessel hull and seawater using air bubbles produced at the vessel bottom. The solution has enabled a 27% reduction in CO 2 emissions, as verified, compared to conventional bulk carriers, exceeding the target figure of 25%. A fun ‘Ships and Things’ Trivia Quiz. What type of vessel was the main theme of the film Grey Lady Down? Who did Ian Smith meet on board HMS Tiger 1966, and HMS fearless in 1968? Which British passenger ship was sunk by a German U-boat off the coast of Ireland on May 7, 1915? Which nuclear powered submarine passed under the north pole in August 1958? Who wrote the enduringly popular poems ‘Sea fever’ and ‘Cargoes’? What was the name of the steam launch in C.S Forester’s novel which was later turned into a successful film? What was the name of Christopher Columbus’ flagship? From which village did the eight lifeboat-men of the Solomon Browne come, before losing their lives attempting to rescue seafarers in December 1981? What nautical hallmark is stamped on silver objects struck in Birmingham?